Six families sued Alex Jones and InfoWars for defamation, among other claims. The plaintiffs include the parents of five children who went to the school as well as family members of first-grade teacher Victoria Leigh Soto and Principal Dawn Hochsprung, according to a statement from the plaintiff's attorneys. According to the statement, the plaintiffs allege a "years-long campaign of abusive and outrageous false statements in which Jones and the other defendants have developed, amplified and perpetuated claims that the Sandy Hook massacre was staged and that the 26 families who lost loved ones that day are paid actors who faked their relative's deaths." 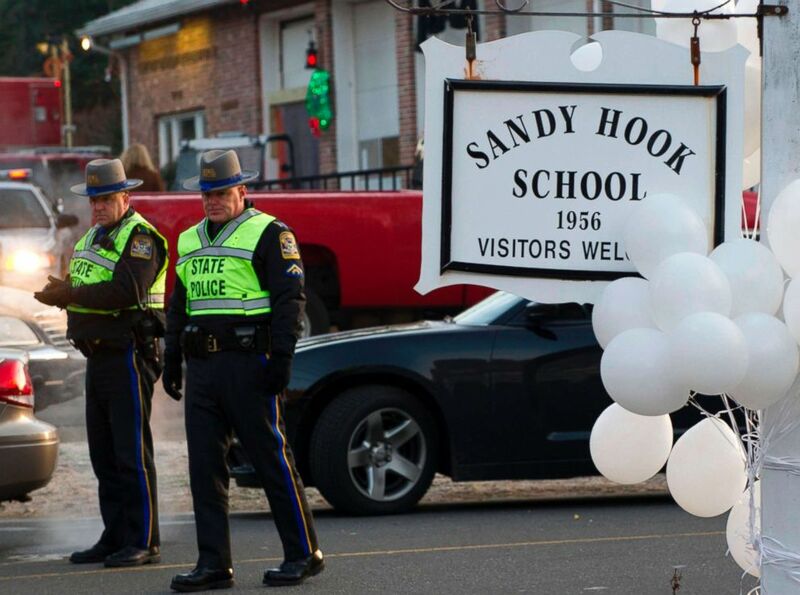 (Don Emmert/AFP/Getty Images) Police stand guard at the entrance after a mass shooting at the Sandy Hook School in Newtown, Conn., Dec. 15, 2012. It goes on to say that "Jones' actions subjected the families and survivors of the Sandy Hook shooting to physical confrontations and harassment, death threats and personal attacks on social media." "From the beginning, we have alleged that Alex Jones and his financial network trafficked in lies and hate in order to profit from the grief of Sandy Hook families. That is what we intend to prove, and today's ruling advances that effort," Chris Mattei, one of the attorneys representing the families, said in the statement. "We look forward to gaining access to Infowars' internal marketing and financial documents to show that Jones has built an empire as nothing more than a conspiracy profiteer, as alleged in our complaint." Jones has sought to dismiss the lawsuit. "Plaintiffs suffered a horrible tragedy," his defense attorney, Jay M. Wolman, wrote in a motion to dismiss the lawsuit. "Alex Jones and Infowars are not responsible for this tragedy. To punish them for First Amendment protected speech on this matter of public concern will not bring back the lives lost." Wolman did not immediately respond to ABC News' requests for comment. The judge’s ruling on discovery gives the plaintiffs access to any communication Jones had about the Newtown massacre and to documents that could point to the inner workings of Infowars.